Washington Gov. Jay Inslee speaks at the Battle Born Progress Progressive Summit Saturday in North Las Vegas, Nev. Inslee pitched his record tackling climate change, gun control measures, raising the minimum wage and expanding paid family leave to Nevada progressive activists in the early presidential nominating state. NORTH LAS VEGAS, Nevada — The Democratic presidential sweepstakes might seem like a tale of Joe Biden and the Seven Senators, but there are plenty of governors and mayors looking for a chance to steal the spotlight from the former vice president and other headliners. 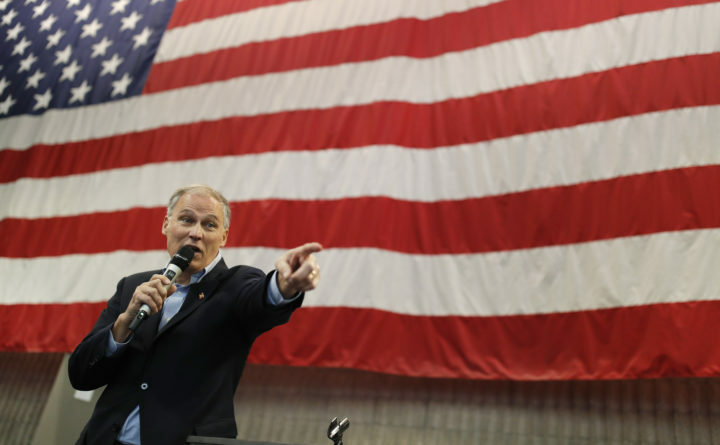 “I looked him in the eye and said, ‘You know what, you’ve got to do less tweeting and more listening to teachers,'” Inslee said.